The Bottom Line: A perfect entry point for newbies to the Connelly’s Harry Bosch series. For the uninitiated, Connelly’s intrepid hero Harry Bosch was born in 1950 in Los Angeles to Marjorie Phillips Lowe and named after the 15th century Dutch artist. He became an orphan at 11 when his mother, a prostitute, was murdered. He subsequently grew up living in a youth hall and foster homes. As an adult, he joined the army and did two tours in Vietnam before joining the LAPD in 1972. He became a detective after five years in patrol. He’s no spring chicken, and this time, Harry Bosch is back as a volunteer working cold cases for the San Fernando Police Department. When he’s called out to a local drug store where a young pharmacist has been murdered, Bosch and the town’s 3-person detective squad sift through the clues, which lead into the dangerous, big business world of pill mills and prescription drug abuse. It’s classic Connelly fiction, as addictive as ever. 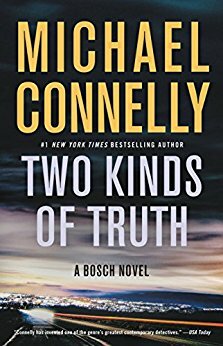 Like Hercule Poirot and many others before him, Bosch seems to get more interesting as a character with each passing volume.